Instant Pot Scarlet Farro Salad is healthy, hearty and delicious! This is one of those dishes you can prep on a Sunday and snack on all week! I work from home, so I love preparing food on Sunday that I can easily grab and eat. This Instant Pot Farro Salad features beets! I absolutely love beets! If you think you don’t, try them mixed with the delicious ingredients of this salad and I bet you’ll change your mind. The Simply Tangy Balsamic Vinaigrette in this salad is EVERYTHING – so many flavors and it brings everything together. Its homemade vinaigrette made SO EASY. Seriously, just add ingredients to a tupperware and shake, or to a bowl and whisk – literally, it takes 2 minutes! Click to get your Instant Pot today! 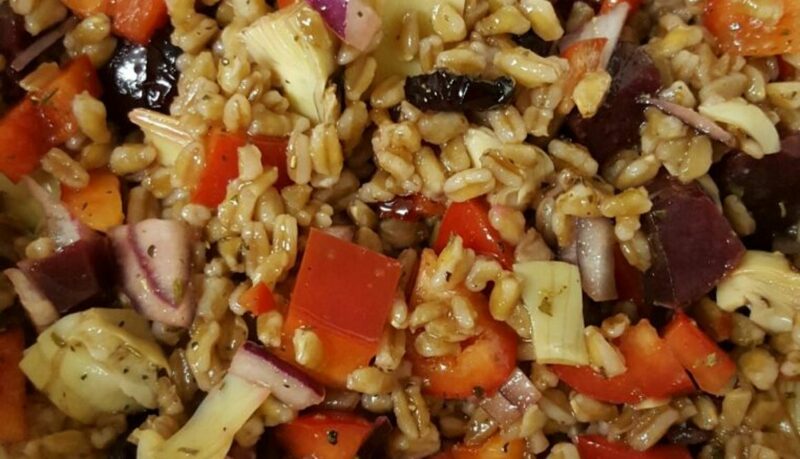 Farro – ever heard of or tasted farro before? If not, literally run to the store right now to buy some. It is so, so good. The texture is somewhere between rice and barley. It cooks in 15 minutes and you can’t mess it up like you can (like I always do) rice. An essential tool to cooking farro: a wire strainer — the little morsels may fall right through your average plastic strainer. This grain is not only healthy, but it is delicious, filling and satisfying — and, what I like most about it, it is DIFFERENT! Most people don’t use it, therefore most people are seriously missing OUT! When I cook and eat something like farro, I swear it just speaks to and fills my soul (and my belly!) Beets also speak to my soul – you should allow this recipe to speak to yours! The varieties can really be endless — You could make a cold salad out of farro just like you can pasta. Today, allow me to introduce the stunningly delicious Instant Pot Scarlet Farro Salad. This Instant Pot Scarlet Farro Salad is healthy, hearty and delicious! Prep on a Sunday, and enjoy it all week! Cook Farro in Instant Pot. Add rinsed farro, water, oil and seasoning. Cook on high pressure 6 minutes and allow natural pressure release for 5 minutes, then release remaining pressure. Set aside. Prepare vinaigrette by combining all ingredients and whisking together well, set aside. You can sub your fave pre-made vinaigrette, about 1/3-1/2 cup. Combine cooked farro and vinaigrette and all remaining ingredients in a bowl. and gently combine. Cover salad and allow to chill in the fridge for at least 30-60 minutes. It is even better the next day! Enjoy! Rinse farro using fine mesh strainer, then cook using my pressure cooker method for Instant Pot Farro. Click the link above for directions! Make the Simply Tangy Vinaigrette – click the link above for directions! You can also sub 1/3-1/2 cup of your fave pre-made vinaigrette. Diced red pepper and red onion finely. Dice artichoke and cooked beets in larger pieces. Measure dried cranberries. Add cooked Instant Pot Farro, Simply Tangy Balsamic Vinaigrette and remaining ingredients to a bowl and gently combine. Chill in fridge for at least 30-60 minutes, then serve and ENJOY! This can be stored in the fridge and enjoyed for a week! This healthy, hearty side dish feeds your SOUL… because this is just wholesomely, soulfully good eats! Makes about 4 generously and delicious 1 cup servings. Click to check out our favorite pressure cooker accessories! 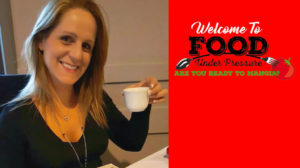 Connect with Food Under Pressure on Facebook, Instagram, Twitter and Pinterest! 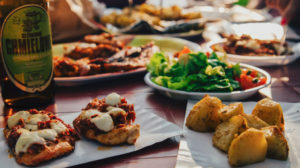 Click to Join our Recipe group on Facebook! Instant Pot Cranberry Sauce is sure to impress all your Thanksgiving guests! Don’t think you like cranberry sauce? You MUST try this! Only EVER had canned cranberry sauce? You definitely MUST try this! Confession… I used to HATE cranberry sauce. 2nd confession… when I say I used to HATE cranberry sauce, it’s kind of fabricated because the truth is I had always REFUSED to try cranberry sauce. 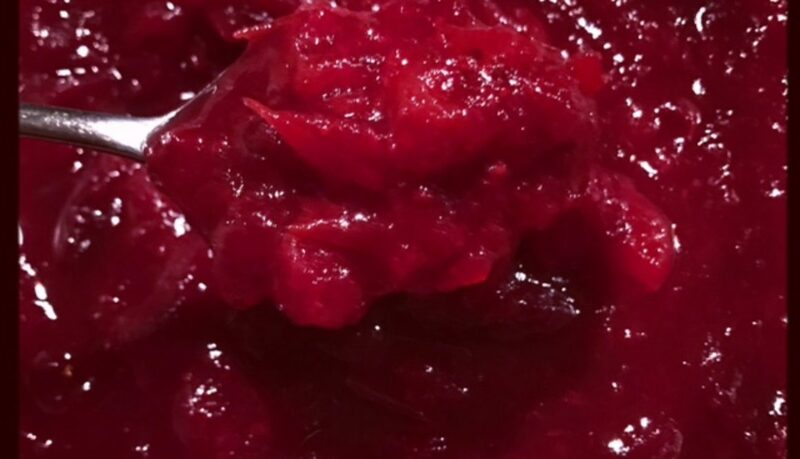 3rd confession… I eat this Instant Pot Cranberry sauce for days. It is so good on toast like jam, over ice cream as a topping, on pancakes and waffles, or just by the spoon full. This Instant Pot Cranberry Sauce is sure to impress your holiday guests - double the recipe & save the leftovers, because it is good on SO many things! Rinse cranberries, and discard any that are badly bruised or that have gone mushy-bad. Pour into Instant Pot insert. Add all other ingredients, then stir. Press “Manual” high pressure and use “+/-“ buttons to set cook time to 15 minutes. When cook time is complete, Instant Pot will beep. Quickly release pressure (QPR) by turning Vent knob to “Venting”. ENJOY the amazing aromas that will come from your pot. Seriously, it smells AMAZING! If you want it super smooth (which I do not), you could use an Immersion blender or regular blender to achieve this. I happen to LOVE the texture just as is! If it seems a little too thin to you, once again, no worries. Allow the sauce to cool - it will thicken as it cools. Store in a tupperware container in the fridge until you are ready to serve. I serve my Orange Cranberry Sauce at room temperature or cooled, but not cold - up to you & yours how you choose to serve it! I use 1/2 cup & think it's perfectly tart and sweet. **You can omit the alcoholic ingredients in preferred - they really help deepen that orange flavor though, and are really yummy in this recipe. Don’t worry, they completely cook out all alcohol! Wash the cranberries well and discard any that have gone mushy-bad. Wash your orange, you’ll be using the zest! It’s really that easy! Simply add all the ingredients to your Instant Pot insert. The hardest part is zesting the orange – make sure you have a good tool. This is the zester I have! Close lid and turn your sealing knob to “sealing”. On manual/pressure cook setting, set cook time to 15 minutes. When cook time is complete, Instant Pot will beep. Quickly release pressure (QPR) by turning Vent knob to “Venting”. ENJOY the amazing aromas that will come from your pot. Seriously, it smells AMAZING! When you open the lid, you may first think it doesn’t look right, or that you didn’t cook it long enough. Have no fear, just stir, squish, stir, squish, stir… If you want it super smooth (which I do not), you could use an Immersion blender or regular blender to achieve this. If it seems a little too thin to you, once again, no worries. Allow the sauce to cool – it will thicken as it cools. I serve my Orange Cranberry Sauce at room temperature or cooled, but not cold – up to you how you serve yours!. This can be made up to 2 or 3 weeks in advance! Or, store after enjoying for 2-3 weeks… that is if you’re lucky enough to have leftovers. This Cranberry Sauce is a-whole-nother-level of AMAZING in so many ways! These Piña Colada Instant Pot Steel Cut Oats are a delicious, healthy breakfast idea made in the pressure cooker – and because it’s made in one pot, there’s little cleanup! 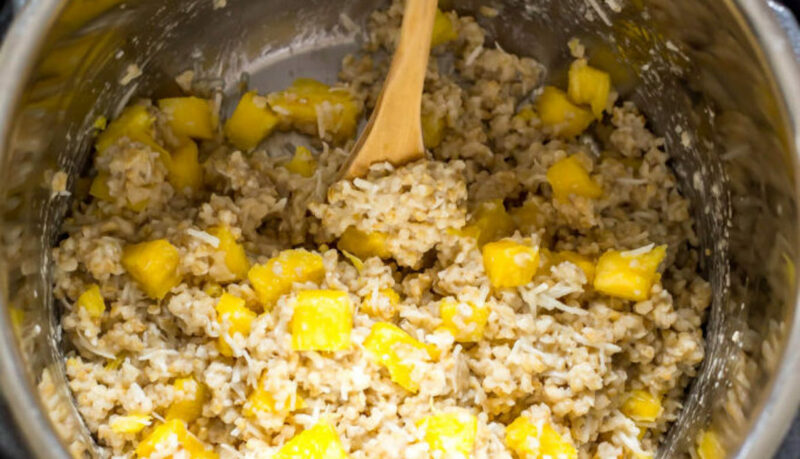 Enjoy this tropical oatmeal all week long! These Piña Colada Instant Pot Steel Cut Oats are so creamy and have just the right amount of sweetness. They can also be eaten hot or cold and prepped ahead of time so you really can’t go wrong if you’re an oatmeal lover! 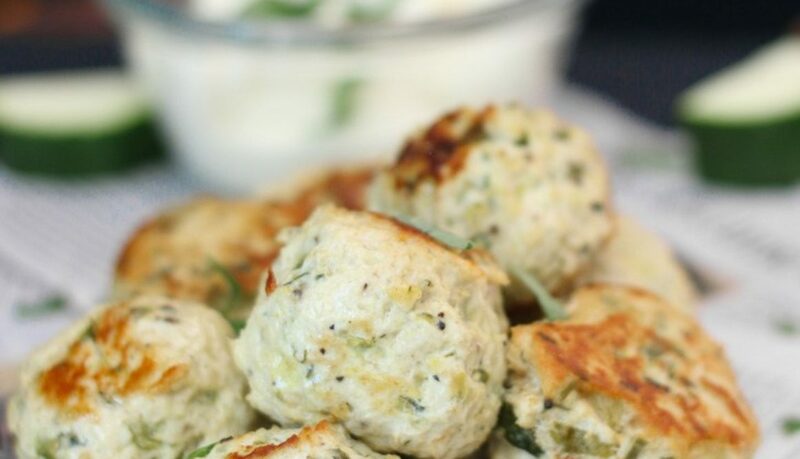 Healthy, chicken meatballs are just what I need in my life right now. Because… have you seen my Alabama Pot Roast recipe? Not the healthiest thing in the world. Sometimes you just want need something light, healthy, full of veg. This is it. And it’s quick. 6 minutes! Fix a big salad on the side while this is cooking and boom! You got a veg filled, healthy dinner for the fam! Food Processor of your choice – I love this Kitchen Aid Food Processor – you get what you pay for! Instant Pot Simple Syrup [Basil Lime] is a must try in summers. It is a flavorful simple sugar syrup enhanced with Basil and Lime. 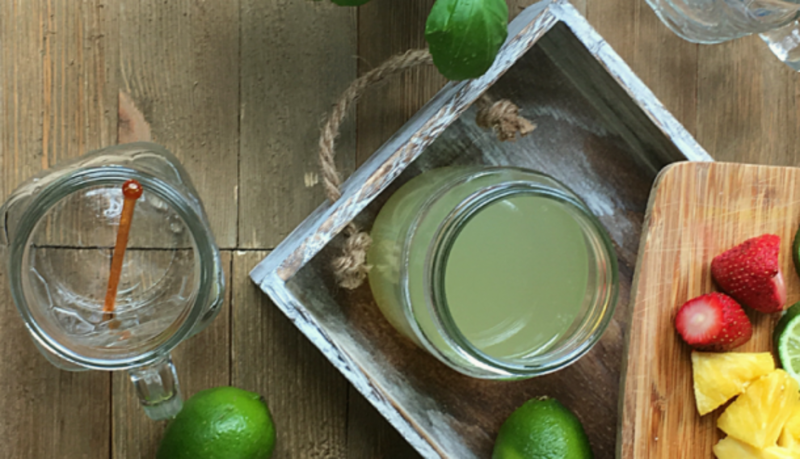 The syrup made in Instant Pot serves as a perfect base to make drinks of your choice. You can use the syrup in making mocktails, cocktails, spritzers, sodas, and much more. Read the post to discover the magic of this easy 4 INGREDIENT RECIPE. Instant Pot Chicken Tacos (Chili Lime flavored) with Mango Salsa! 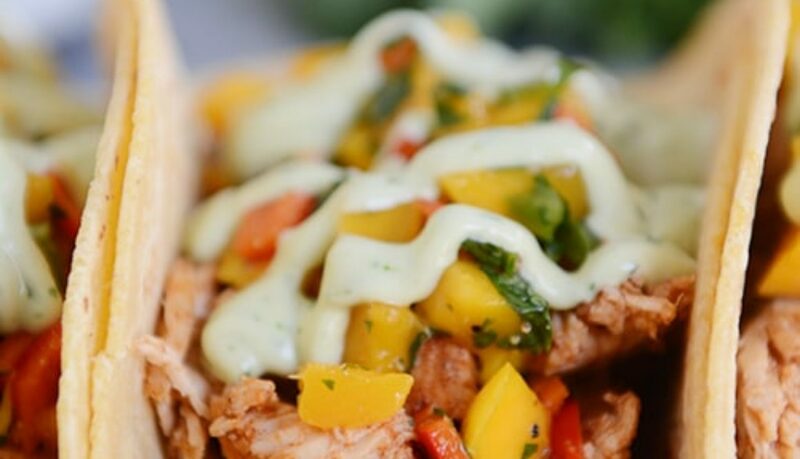 Light and healthy and full of fresh, yummy flavors (that mango salsa just slays me), this chili lime chicken number is such a winner. 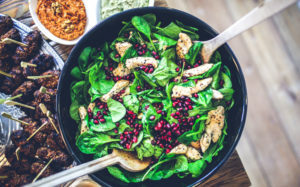 The chicken can be pressure cooked… in an InstantPot, add the chicken and marinade ingredients plus 1/2 cup low-sodium chicken broth or water –> 7 minutes… Let the chicken rest for 5 or so minutes before slicing into strips or shredding. Kitchen Aid Hand Mixer, for EASY shredding chicken! Instant Pot Apple Cider Pork Chops are so soft and tender… I love a good and easy recipe… The best part of this recipe is that you can put a full meal on the table with minimum effort and a fraction of the time, all these while using only the Instant Pot so think, minimum pans to clean. The pork chops, potatoes, and carrots are cooked at the same time. Once everything is done, a flavorful and super easy apple cider sauce is made. 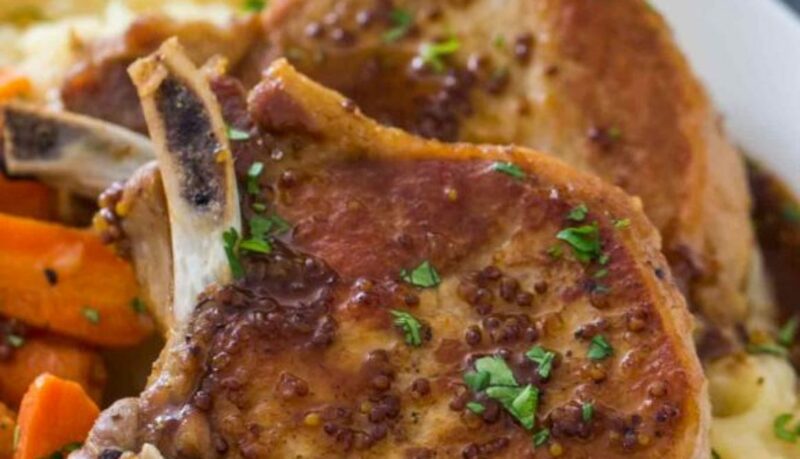 This recipe for Instant Pot Apple Cider Pork Chops is another great combo of sweet and savory, the apple cider mustard sauce has just the right amount of sweetness and slight tanginess to tie this meal together. Astonishingly delicious! Pampered Chef Mix n Chop — Food Under Pressure LOVE’s this product! Instant Pot taco casserole recipe…really easy… full of flavor and lots of cheese! 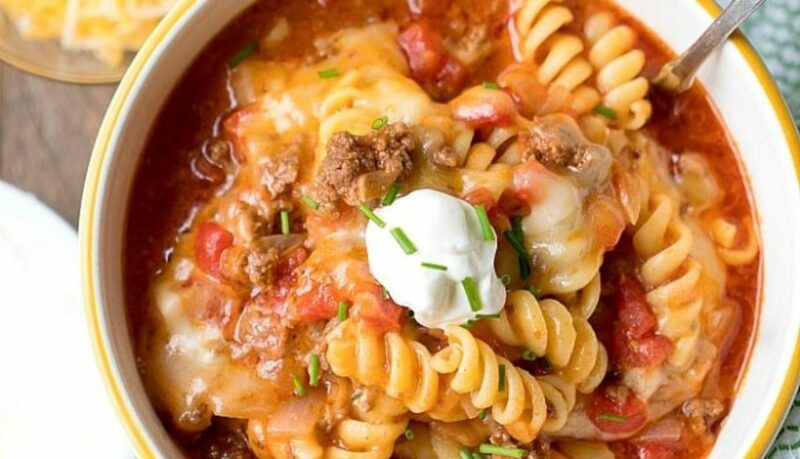 Stir in a spoonful of sour cream for a creamy pressure cooker taco pasta made in just 10 minutes. Dairy free? Leave it out & it will still be delicious! Your whole family will surely love this flavorful dinner and it’s delicious the next day if you have leftovers. 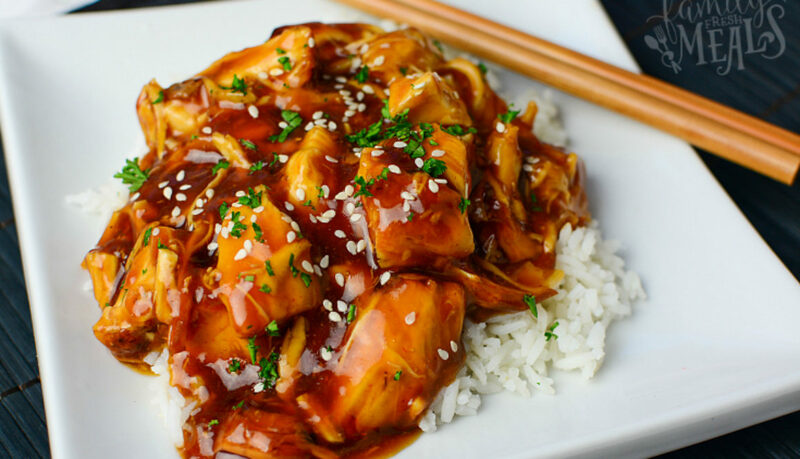 Instant Pot Honey Garlic Chicken is a Chinese-style dish bursting with honey-garlic flavor. And because you make it in the Instant Pot, it’s also really quick to make. Step one, mix up the sauce, pour it over the meat, and cook for 20 minutes. Step two, take out the meat and thicken the sauce. And step three, cut up the meat and toss it with the sauce. Boom, done. Served over rice with a sprinkling of sesame seeds and green onions, it’s a super-flavorful Chinese meal that takes less time than ordering takeout. 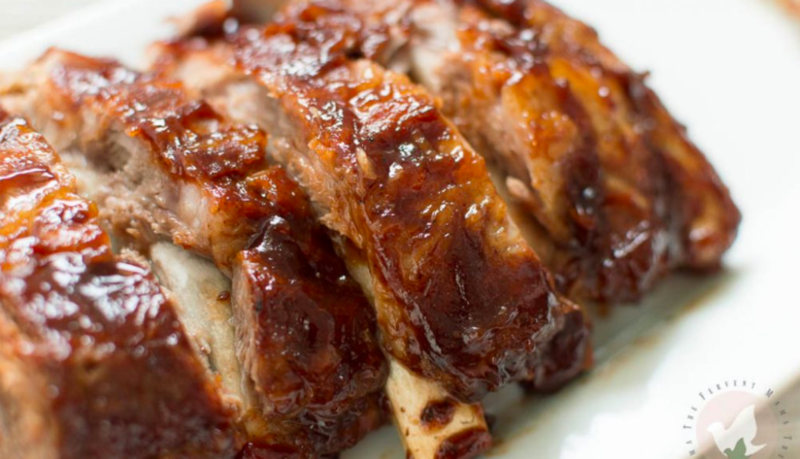 Pressure Cooker BBQ Ribs… nearly perfect! Just under 30 minutes cooking first in the pressure cooker, making the ribs so tender that the bones just pull out clean, and then just a few minutes under the broiler for a BBQ sauce that sticks to the meat like white on rice. Fair warning, you won’t cook ribs on the grill again after eating these. There’s just something absolutely irresistible about a good rack of ribs, and these are no exception. These pressure cooker ribs are melt in your mouth good!